This review comes a little late. It's been over three months since Hand to God has premiered on Broadway. It's drawn a lot of attention, it was nominated for, and snubbed of, multiple Tonys, and most recently, became "that play where the audience member tried to charge his phone onstage". 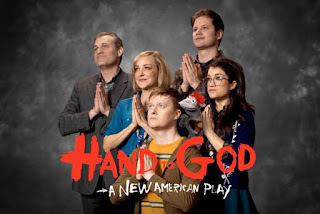 But ignoring all of that, what do you first think of when you see the poster for Hand to God? What are your first impressions? Does it seem eerie? These people are smiling but the background is dark. There's a creepy looking sock puppet amidst these seemingly devout, innocently-looking folks. What could that possibly mean? What happens in this play? Personally, I think of all the promotional posters for the Broadway shows currently playing, none is as thought-provoking as this one. And I was all the more satisfied after seeing the show because of how unusual this poster is. In Hand to God, we are given an idea of just how much pressure can build in a small Christian town in Texas. Jason, a shy teen, is expected to be obedient and supportive of his uptight mother Margery, as she has just lost her husband. Margery, facing pressure from the town pastor about a puppet show to perform in front of the whole congregation, is on the edge. While also suffering from the torment of bullies like Timothy, another teen in his Church puppet class, Jason retreats to the companionship of his deranged, seemingly-possessed sock puppet Tyrone. Tyrone soon embarks on a tirade as he seeks to unlock Jason's potential to be bad and stick up for himself. Comedy ensues thereafter. The show is deranged; there's no doubt about that. Steven Boyer, who plays Jason, simultaneously operates and voices Tyrone the sock puppet while playing the role of Jason. Throughout the entire show, the dirty and hilarious back and forth between Jason and Tyrone is so important to the show as it contrasts the two characters and how one empowers the other. Its insanity acts as the gateway to the wild comedy that makes it as good as it is. Hand to God, while being hysterical, is very symbolic. It chronicles the primitive necessity of right and wrong that human beings have naturally instilled upon themselves since the beginning of time. The grand existential message is also coupled with the message of how our smallest, inner vices, wants, and needs can inspire in us a new drive and the seeking to be a different person in order to "better" ourselves. So if you haven't caught this play and you've been dying to find out what this show is about after seeing that awesome promotional everywhere you're looking for something dramatic, dark, and brooding that takes as many liberties as an Off-Broadway play, look no further. Hand to God will not disappoint and at the same time will make you question your sanity (in a good way of course). Hand to God plays at the Booth Theatre and Applause can provide tickets for you! Just give us a call!